The Social Colony of Floor-Tiles produces a pattern of flashing lights and buzzing sounds when you step on it. The tiles communicate socially with their neighbours to produce larger emergent effects. They can be arranged in different ways and programmed with new behaviours to create new effects. New tiles can be added in an ad-hoc and scalable manner to expand or reshape the floor, or create other kinds of interactive surfaces. 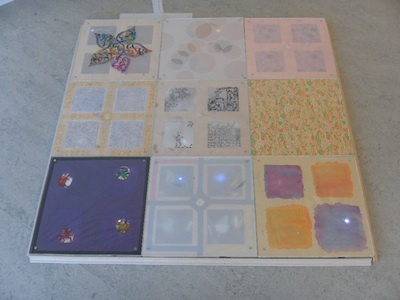 Each artist constructed, programmed, and decorated their own customised tile. 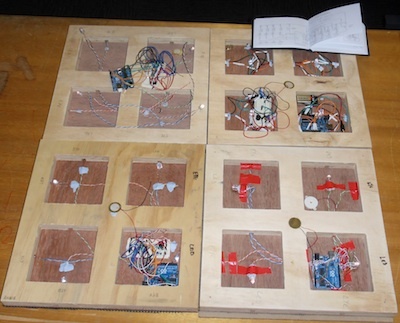 The tiles are cellular automata constructed from an arduino microprocessor, electronic sensors, LEDS and piezo buzzers by students in the Masters unit on Design, Interaction, Environment. The Social Colony of Floor Tiles is currently being shown in the Creative Practice exhibition curated by Diane Firth at the Belconnen Arts Centre in Canberra from 22 July – 7 August 2011.